Although the public inaugurations of U.S. Presidents typically occur at the U.S. Capitol Building, Barack Obama's second swearing-in officially took place privately in the Blue Room of the White House on January 20, 2013. This image depicts a scene from the public swearing-in which occurred, at the West Front of the Capitol, the following day. Photo by White House photographer Lawrence Jackson. Public Domain. An Inauguration is a ceremony to mark the start of a new four-year term of a president of the United States of America. In George Washington's day, America’s new chief executive learned from Congress that he had won the presidency. The General, who had previously led the new nation to victory in America's war for independence, borrowed money to pay off his debts in Virginia—where he lived at Mount Vernon—and traveled to New York. 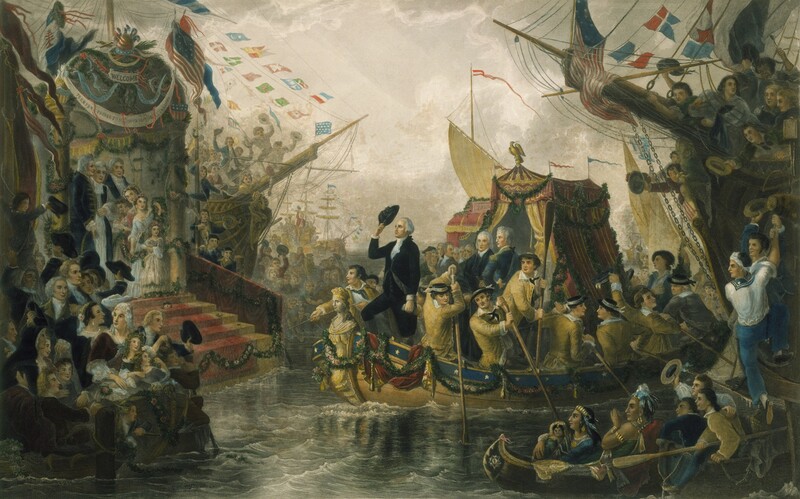 On April 30, 1789, Washington came across the Hudson River in a specially built and decorated barge. This custom gave rise to Inauguration floats that are now part of the scene in the official parades. Washington's inaugural ceremony was performed on the balcony of Federal Hall on Wall Street in New York City. The president then went indoors to read his inaugural address to Congress. The evening celebration, which included fireworks, was opened and closed by thirteen skyrockets and thirteen cannons being fired. Today that tradition continues with a 21-gun salute fired from artillery pieces. When Does Inauguration Day Occur? Why Is the Presidential Inauguration Important? The United States of America is a Democratic Republic. That means the voters elect someone to represent them. The elections determine who is the representatives, or, in the case of the Inauguration, who will lead the country’s Executive Branch. The Inauguration is important because it represents the peaceful transfer of power. It is also a way to celebrate the voter’s decision. Who Gives the Presidential Oath of Office? I, <president’s name>, do solemnly swear that I will support and defend the Constitution of the United States against all enemies, foreign and domestic; that I will bear true faith and allegiance to the same; that I take this obligation freely, without any mental reservation or purpose of evasion; and that I will well and faithfully discharge the duties of the office on which I am about to enter. So help me God. What is the Inaugural Parade? The Inaugural Parade, on Pennsylvania Avenue, passes the presidential reviewing stand in front of the White House. The typical duration of the parade is about two hours and proceeds along 1.5 miles of Pennsylvania Avenue in view of the presidential party. The President, Vice-President, their respective families and members of the government and military view the parade from an enclosed stand at the edge of the North Lawn (of the White House). Where Is the Inauguration Held? The event is held at the U.S. Capitol's western front in Washington DC. What Does the Word “Inauguration” Mean? If a country has a monarchy, which means the leader is not chosen by the people but born into that position such as a king or queen, the ceremony is called a coronation. It is highlighted by a crown being placed on the head of the one being honored. Who Is in the Inaugural Parade? Both military and civilian participants, from all 50 states and the District of Columbia, are involved as well as bands and floats. When Did the First Women's March Coincide with an Inauguration? In November of 1912, after the federal election, Alice Paul had an idea. Why not have a women's march at the time of Woodrow Wilson's inauguration? She, and her fellow suffragists, were upset that their petitions for women's suffrage were never taken seriously by Congress. If the women and their supporters held a march, the day before Wilson's inauguration, it would surely draw attention to their issues. When the Women's March actually took place—on March 3, 1913—the new President took notice (and so did the press). Not everyone supported this audacious move, by the suffragists, and many of them endured not just ridicule but injuries (from the violence against them). One headline read: "Capital Mobs Made Converts to Suffrage." Al Haskvitz "Fun Activities and Facts about the Presidential Inauguration" AwesomeStories.com. Nov 23, 2016. Apr 25, 2019.